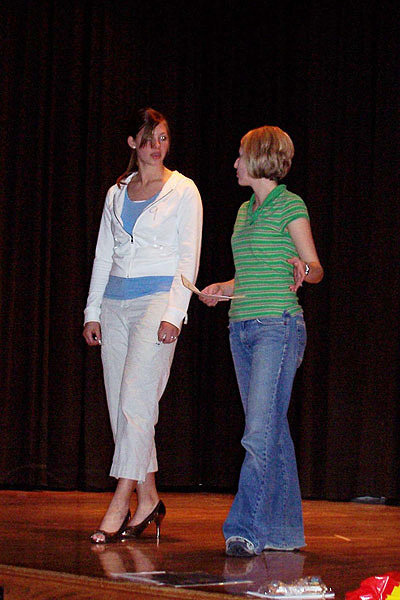 April 28, 2006 | SMITHFIELD -- Twenty high school juniors and seniors will compete in the Health Days Scholarship pageant tonight. The five winning women will represent Smithfield in the Health Days parade on a float and will receive a $350 scholarship that they can use in the next two years, a tiara and $100 to use toward a dress for the parade. "We have a great group of girls; they're all very talented and the pageant will be a lot of fun," said Kari Hoggan, pageant organizer. Hoggan said the participants will be judged on an interview worth 30 points that will take place with a panel of five judges Friday afternoon, a short personal introduction worth 20 points, presentation and poise onstage worth 20 points, and their unprepared answer to an impromptu question that is 30 points. In addition to the pageant night itself, the women have done at least ten hours of community service doing things such as making hats and blankets for the homeless, volunteering at a nursing home and helping build homes for low income families. The women will have dinner with the judges and pageant organizers Friday before the pageant. For their participation, Smithfield city buys the women a piece of jewelry and Miss Congeniality, who is voted on by the women, receives an extra piece of jewelry and will stand on the stage with the final five winners tonight. While the Smithfield Scholarship Pageant is running smoothly now, Hoggan says there was a time when it was in danger of ending. "One year they didn't have anybody who was willing to run it, so it just didn't happen; but my mom went to the city council and told them how important she thought it was for the girls and they let her run it the next year," said Hoggan, who got involved when she participated in the pageant in 1985. The pageant is hosted and will include musical numbers by Shirley Whitman. The participants are Aimee Heaps, Adrianne Elder, Breeann Law, Katie O'Brien, Aubree Gleed, Katherine Hullinger, Megan Low, Audrey Hunsaker, Ashley Hoyt, Sheri Winn, Alana Wild, Alicia Warren, Ana Hernandez, Rachael Rust, Melissa Daines, Melissa Guymon, Aliss Wilde, Jodi Knight, Kirsten Green and Sarah Hebdon. The pageant is tonight at 7 p.m. at the LDS Stake Center, 120 S. 600 East.